The Fairfax County Board of Supervisors on Tuesday approved a contract that lets building get underway on the Silver Line’s next parking structure. The $57 million garage at the Innovation Center Metro Station will have space for approximately 2,100 cars. 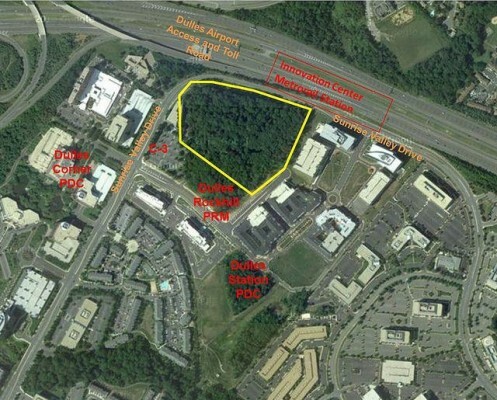 Innovation Center, to be built as part of Phase II of the Silver Line, will be located near the intersection of the Dulles Toll Road and Route 28. Fairfax County committed to building the garage as part of the agreement reached three years ago to pay for the Silver Line’s second phase. The county plans to pay for the garage by selling parking revenue bonds from the Fairfax County Economic Development Authority. The Wiehle-Reston East garage –which has 3,300 parking spaces, as well as bus bays, kiss-and-ride lanes and a secure bike room — opened along with the Silver Line’s Phase I last Saturday. After sharing the costs to built the $90 million garage, developer Comstock will pay the county $2.9 million annually in rent in order to build the 1.5 million-square-foot Reston Station mixed use development above the garage. The 450-unit BLVD apartments are currently under construction at Reston Station. 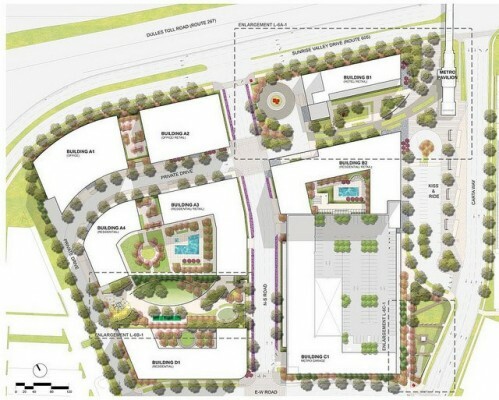 Comstock plans two office towers, a hotel and retail space there as well. Preliminary site work for Innovation Center, which will built as part of partnership with Rock Engineering Company and Nugget Joint Venture, is expected to begin in 2015 and construction is planned for 2016, the county said. The Silver Line’s Phase II is projected for a 2018 opening. The county will own, operate and maintain the garage that will be a three- to six-minute walk to the Metro station’s entrance, according to the agreement. The garage will be integrated into a new, 1.6 million-square-foot mixed-use development that will feature a 190-room hotel; 104,000 square feet of retail; 501,000 square feet of office; and about 1,005 apartments spread across seven buildings. A projected 2,108 parking spaces. About 25 kiss-and-ride spaces that include a taxi stand, plus four motorcycle spaces. A secure bike room for about 100 bicycles. The eight-level garage will have one story below ground and seven above, including rooftop parking. This top level incorporates planted trees, helping to screen parked cars from the taller, neighboring buildings. The transaction ratifies a land swap with developers Rock Engineering Company and Nugget Joint Venture, which are developing the site together. The trade allowed the county and developers each to consolidate land holdings at the 14.68-acre site. Currently undeveloped, it sits directly south of the Toll Road where the new Metro station will be built. The deal gives the county a 5.5-acre spot for the garage and kiss-and-ride spaces while the developers will build out the remaining 9.1 acres. The county agreed to share the cost for common infrastructure needed on the 14.68-acre site, along with a pocket park and a one-acre, landscaped plaza surrounding the entrance to the Metro station. The pocket park will be used to filter and retain stormwater from the entire site. The county will pick up about 40 percent of these costs or about $7 million, and this cost is included in the estimated $57 million total amount that will take to design and build the garage.